This is the latest full-length from Ukrainian ambient black metal band Deviator. It follows on from the 2011 compilation Way of Warriors, Hymn To Immortals, which I reviewed a while ago. Fehu - Fohat - Fire is Deviator's third full length, although that band have released a number of demos, splits and EPs since their inception in 2007. I was lucky enough to receive a physical copy all the way from Deviator themselves. It was produced in cooperation between Depressive Illusions Records and lead creator, Lord Hastner's own label Kundalini Records and is only limited to 101 worldwide. The packaging and the artwork is top notch, so I was really excited to listen to the contents. As anyone who has listened to Deviator's music in the past will know, there is a heavy leaning towards ambient textures in their music and that shows through in the initial piano of opener Long Road To Salvation. This is merely an introduction though, to the frostbitten cold that lies ahead. The whispered vocals in Lord Hastner's native tongue at the start of Cost Of Freedom sent chills down my spine. The black metal that then presents itself is equally as chilling. Deviator is essentially a solo effort by Lord Hastner, who tends to play all instruments on recordings. The recording itself is very clean and clear, but it stills retains the essence of an organic black metal record, where the music seems more alive than more over-produced black metal albums can sound. Way of Warriors - Hymn To Immortals was the title-track on Deviator's 2011 compilation but here it sounds a lot heavier, especially in the opening bars. The double bass can be heard in the background grinding away and the vocals are low screams that sound almost blood curdling. There are clean vocals the chaos, but these even manage to sound as possessed as when Lord Hastner is screaming. There are a lot of twists and turns to this song, as it's over seven and a half minutes in length, but the ideas used in it are varied and definitely add to the sense of foreboding that Deviator try to create. There are moments of sludge inspired riffage here as well as some subtle introspective passages that show a very mature style of musicianship and song writing. There definitely seems to be different influences creeping into Deviator's music on Fehu - Fohat - Fire. Some of guitar melodies and textures used seem to take cues from a lot of traditional metal, yet still retain their black metal essence. This is especially true of Eternity of Blood. I'd go as far to say that the opening riffs are even hummable! In parts, this album sounds very uplifting but as Deviator will probably attest, this is meant in a cosmic way and not an emotional way. The penultimate song, My Thoughts...They Have No Rest, is a cover of fellow Ukrainian ambient black metal band Winter Depression. The song originally appeared on a split called Autumnal Melancholie, which was between Winter Depression and a band called Zarach "Baal" Tharagh, a similar entity from France. This song is purely instrumental and has some heavenly piano at it's core. The closing song Burning Bridges Become Ashes. This sees Deviator switch back to their cold black metal sound. The rhythm section and the guitars seem a lot faster at times in this song, yet it still retains that melody which pleases me in black metal. It's kind of symphonic but not in a cheesy way. It adds a strong dimension to the album. That metal influence creeps in again at certain points, which again, is nice to hear. For someone who wasn't familiar with black metal below what was featured in the bigger metal publications, I feel at home listening to this. Fehu - Fohat - Fire is an assured record, which should help, gain Deviator more popularity, if they want it! It's well produced, well written and leaves you longing for eternal darkness! 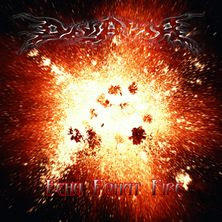 You can here Eternity Of Blood, from Fehu - Fohat -Fire at Deviator's website - http://www.wix.com/hastner/black-flame. You can also purchase a copy of the CD from Depressive Illusions Records at http://depressiveillusions.com/. Deviator is also on Facebook at http://www.facebook.com/pages/DeviatorOfficial-Epic-BlackDeath-Metal. Really professionally well-written review and interesting review!